You see a map that displays territory of Russia, of Ukraine. interesting map of Velyka Pysarivka 1 cm to 1 km for gps. free map of Kirikovka for you. detailed map of Spodaryushino calibrated here. map of Poroz for you. free map of Dronovka here. actual map of Zhigaylovka here. topographic map of Yezdetskoye 1 cm to 1 km download for free. interesting map of Yankov Rog 1 cm to 1 km displayed. detailed map of Yamnoye here. free map of Vol'noye calibrated presented. detailed map of Verkhopozhnya 1 cm to 1 km presented. detailed map of Verkholyudzha и OziExplorer calibration this. 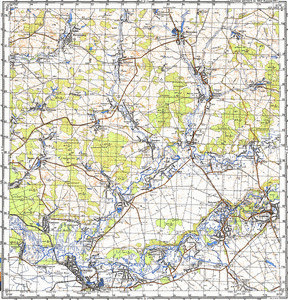 topographic map of Tarasovka calibrated free download. detailed map of Streletskaya with gps calibration for Garmin. topographic map of Staroryabina calibrated presented. actual map of Spornoye presented. free map of Soldatskoye calibrated presented.